Pictured is Manager Lloyd Akers (l) congratulating Walden Roush, founder of the West Virginia State Farm Museum. 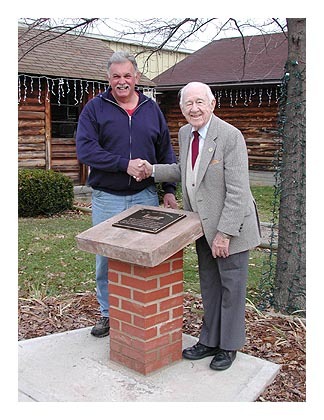 The ceremony dedicated a plaque placed there in memory of the decades of work accomplished by Mr. Roush and his wife Louise Roush. We could devote an entire web site to the good work performed by Mr. and Mrs. Roush.